First off, a great big THANK YOU to the 200+ folks who came out to celebrate the release of ‘Signs’ at the Eugene O’Neill Theater in Waterford last weekend! It was quite a show… we had a slew of special guests sitting in, and our good friends Black Marmot down from Boston to open the show. We’ll post some more photos soon, but here’s one great gallery from WailingCity.com. 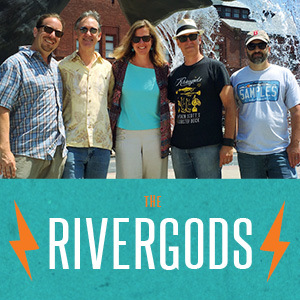 Or, head on over to the Rivergods’ Facebook page to see a bunch more photos and video submitted by other fans! The reviews are rolling in! “Ben’s rough-edged tone, reminiscent of The Waterboys’ Mike Scott, and Nancy’s silky, Joan Baez-like sound fit together hand in glove. Country, gospel, pop and funky backbeats mix seamlessly…” —New Haven Advocate. Read some of them here, and stay tuned… there’s more in the works. And… get the record now! Signs is now available for download! $9.99 for the whole album, including artwork/liner notes, or $.99 per song. Other purchase options coming soon, too! Check out the full review at the Sound Waves website here (page 19)! Don’t miss the Signs CD release party Saturday, March 26 at the Eugene O’Neill Theater Rose Barn in Waterford, CT… more info here.